One day, though, Laura wanted to make her own doll, no stuffing required! Digging into my stash, she selected tea-stained cotton for the body, muslin for a petticoat and rose homespun for an apron. She carefully drew and cut the body as one piece. Then she used this as a template to make clothes and accessories, which were cut and glued on using fabric glue sticks. 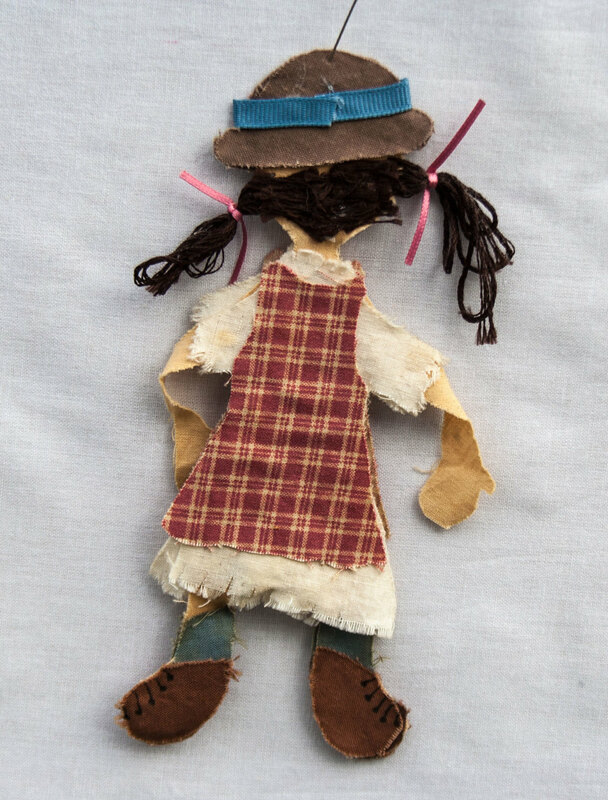 Laura "dressed" her little doll in blue stockings, "leather" shoes with laces and a matching hat trimmed in blue grosgrain and pink heart brooch. She sewed long curly locks of embroidery floss to the side of her doll's head and tied them with skinny satin ribbon, forming pigtails. The finishing touch - a big happy smile! I'm proud to say my daughter and I still enjoy creating things together. She's a young woman now and nearly 25 years have passed since Laura made her little doll. Treasured, it hangs on my closet door and reminds me daily about the magic of making something.